March 12, 2016 February 16, 2017 Amanda B. 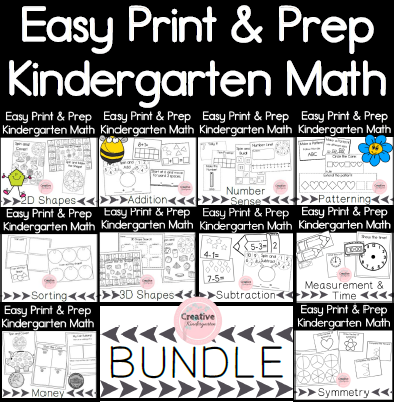 Here is a quick and fun math center that requires hardly any prep (just some photocopying) and will keep your students busy! Send your students on a 3D shape hunt. Give them the recording sheet and a pencil and they do the rest of the work! The goal is for them to find everyday objects around the classroom that are 3D shapes. Then they must record what they have found in the corresponding shape’s box by drawing a picture of it. This is a simple and effective math activity that can be easily incorporate into your math centers! Do you like what you see? There is a whole pack of math write-the-room activities available in my TpT store. It contains 5 write-the-room activities for your kindergarten class that need no-prep! Want to hear the best part? I am offering the 3D Shape Search as a FREEBIE!